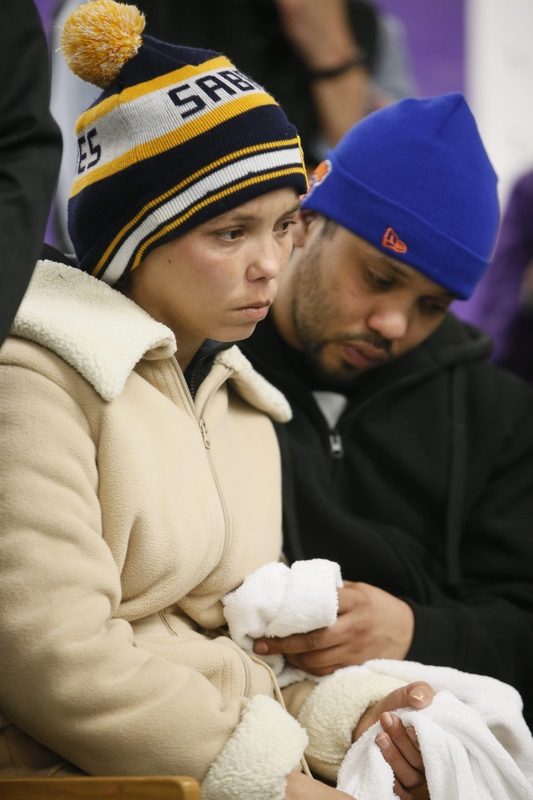 Sarah Santiago and Carlos Rodriguez, the mother and stepfather of 7-year-old Alexavier Torres-Santiago, comfort each other during a news conference Tuesday at Frank Sedita Academy School 30. The fire that killed 7-year-old Alexavier Torres-Santiago quickly fanned through the wood-frame apartment house where he and his family lived, Sarah Santiago, the boy’s mother, said Tuesday. “We woke up, and the place was full of smoke and fire, and we started yelling for our children to get everyone out of the house,” a visibly shaken Santiago said at Frank Sedita Academy School 30. Alexavier and his three siblings attended the bilingual program at the West Side school after the family moved here from Humacao, Puerto Rico, in November. “Alexavier was a friendly kid who was hungry for life,” his mother said, wearing a Sabres hat she found in his school desk and clutching a small stuffed animal that had belonged to him. Santiago, speaking through a translator, said there were no obvious fire hazards in the house. She sat next to her husband, Carlos Rodriguez, the boy’s stepfather, as officials announced that an emergency fund has been set up on the family’s behalf. The fire Sunday at 1400 Fillmore Ave. left the family homeless. Buffalo School Superintendent Pamela C. Brown said social workers, counselors and psychologists are available to help the family. Alexavier’s siblings are in kindergarten and the third and fifth grades. “I’m glad this fund has been established and we have an opportunity to support this family and help them deal with some of the tragedy’s challenges right now, in addition to the loss of their son,” Brown said. Brown said she will make a personal contribution to the fund and encouraged others to do so. Donations can be sent to M&T Bank, 130 Grant St., Buffalo, NY 14213. The benefit fund account number is 9864160693. The family lost all of its furnishings. Their main needs include a refrigerator, dining and living room sets, and six beds. They also need clothing. Information on types and sizes can be found at buffaloschools.org. Donations can be brought to Asbury Shalom Zone, 520 Seventh St., on the West Side. Sedita Academy Principal Wanda Schoenfeld recalled sitting next to Alexavier while in his classroom recently for an observation. She said he pulled out his math notebook followed by his science notebook, speaking excitedly in Spanish to explain what he had learned.